As air travel is growing incredibly quickly and passenger numbers are booming all over the world, it is a natural consequence that aircraft manufacturing rates and deliveries have been ramping up, and ultimately the level of competition between airlines is becoming more and more sophisticated. In recent years, there have been big changes and great improvements in passengers’ in-flight experience. Indeed, the passenger experience is essential to airlines’ strategies today. The focus is no longer just on the pure transport service: indeed the availability of a large network with multiple destinations as well as appropriate schedules for flights is almost a commodity nowadays, especially with worldwide alliances, code-shares and partnerships. The fierce competition between airlines is leading to further enrichment of the travel concept to make plane travel more pleasant, which definitely adds value to airlines’ relationships with their passengers. Hence most airline marketing campaigns prioritize items such as food, comfort and IFE systems. 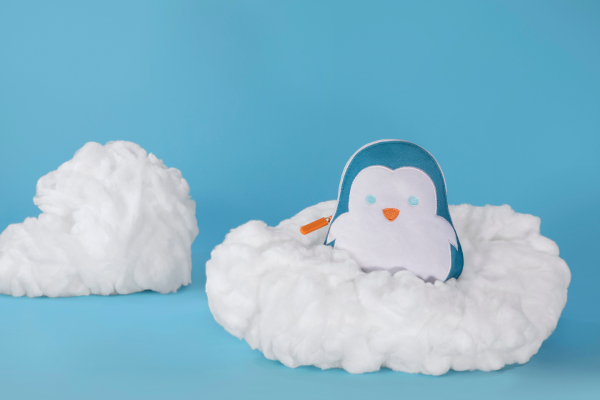 More competition leads to a greater need for airlines to differentiate themselves from all the others, and brand image and identity are key factors for success. Branding means visibility, and visuals are essential in our society and culture. When we board an aircraft the cabin should become our ‘room’ or our ‘office’, rather just a ‘place’ for duration of a flight. As a consequence, colors and lighting contribute to creating a loving feeling, while branding elements establish the relationship between passengers and an airlines’ brand image. ABC International has been developing cabin branding elements since 2008, and by following a growth path and investing in this field, the company is now specialized in cabin branding design, certification, manufacturing and approval. Cabin branding is the link between a positive flight experience and the development of a sense of loyalty towards an airline in the minds of passengers. Nowadays, airlines have a good awareness of the need to be easily recognizable during every single moment of the flight experience. 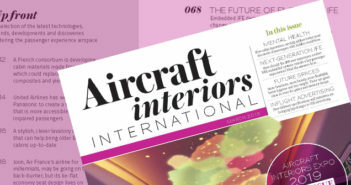 Effective branding elements are essential for airlines seeking to create a deep emotional connection with their passengers, and a philosophy of ABC International is to strengthen brands in order to increase their customers’ trust in the service purchased. In other words, brand equity is the incremental value added by a brand’s image, and it strongly influences brand and purchasing preference. A confirmation for this comes from Gudmundur Oskarsson, head of marketing & sales at Air Iceland, who stated: “The Air Iceland logo, in the shape of a winged horse, has played a large role in the region in and around Iceland throughout Iceland’s aviation history. Through time, it has evolved and modernized, always as an important part of Icelandic aviation. We instaledl decorative crests designed and manufactured by ABC International on our Bombardier DHC-8 202Qs and DHC-8 402Qs, supported by an anodized lightweight aluminum panel. Brand identity must be aligned with a strong brand image. When these features are fused together, brand equity becomes the surplus value which helps to establish loyalty. This pathway goes through the decision-making steps of awareness, interest, desire and satisfaction. In addition to recognizing the importance of brand equity on airline profitability, it is becoming very important for airlines to adopt specific branding strategies in order to build up sustained competitive advantages. In other words, airlines have to focus maintaining relationships with their customers beyond the flight experience. Therefore, airlines need to highlight their company’s logo in the finest and most effective way. The aircraft cabin is a unique environment where the guest (passenger) is hosted and is under the care of the airline. Aircraft cabins represent the ‘home’ of an airline and have to be aligned with branding strategies in order to transmit and transfer that airline’s tangible and intangible value to passengers. 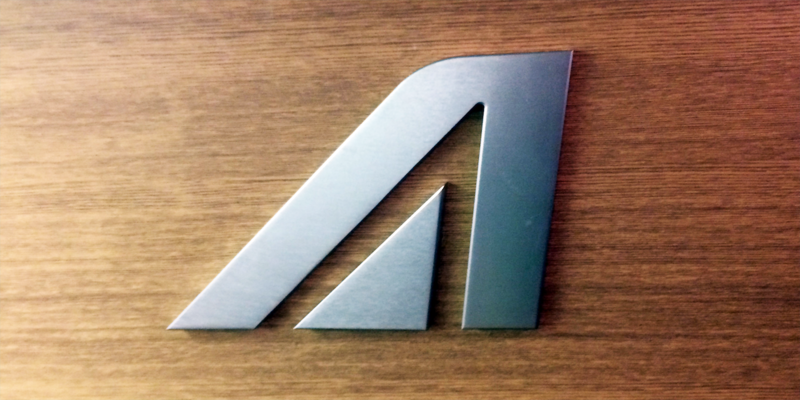 A good example is Alitalia’s new logo and livery, revealed in June 2015. The new cabin interiors are comfortable and refined, and the attention to detail is clear as soon you come on board. ABC can implement and combine branding expertise with DOA cabin interiors skills and knowledge, as demonstrated when we were asked to work on a big retrofit project with FL Technics, a major MRO company. 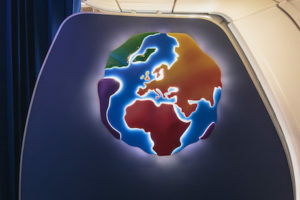 We worked in close collaboration with their team and took on the task of designing, manufacturing and certifying a customized cabin monument and a new decorative crest with backlit LED illumination, for Small Planet Airlines. The outcome was really fantastic. 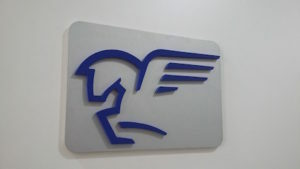 In conclusion, decorative crests can be a key element of an airline branding strategy, which can create a deep emotional connection with passengers.